LeEco, the Chinese Internet Ecosystem company has announced its Super3 TV series in India. After winning over Android smartphone users in India, Chinese technology giant LeEco is now applying the same tried and tested formula in order to make waves in the the Indian TV set market. 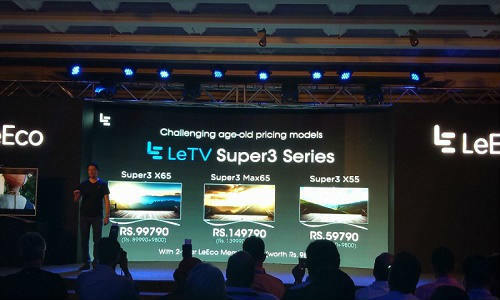 LeEco unveiled its new range of Super TVs at its product launch event in New Delhi earlier today, and the LeEco Super3 smart TV series include the Super3 X55 model with a 55-inch screen, and the Super3 X65 and Super3 Max65 models, with 65-inch displays. The Le Super3 Max65 is the most expensive of the lot priced at Rs 1,49, 790, while Super3 X65 will cost Rs 99,790, and Super3 X55 is the cheapest at Rs 59,790. The new television sets will be available on LeMall.com and Flipkart during preview sale dates between August 10-12. The company will offer Rs 5000 instant discount to all HDFC credit card users during the sale. After the preview sale, LeEco’s Super3 series televisions will be available via flash sale. The company is yet to confirm dates for the flash sale. LeEco is offering two years of LeEco Membership with their Super 3 series smart TVs that will allow you to access the company’s content ecosystem, including Eros content, without a cable connection. You also get access to content-viewing apps like Levidi, LIVE, LeView, and Panosearch, along with a special LE Key for accessing shortcuts to frequently used apps. All the three models will receive live updates to improve the user experience. Be the first to comment on "LeEco 4K Android Super3 TV series launched in India"